Pie Party Potluck LIVE! didn’t happen in 2013 and it almost didn’t happen in 2014. The last Pie Party was in October 2012. I was too busy with my show Chocabaret in 2013. Plus, that was the year we tried to throw the ill-fated Tea Party-Dance Party: where a high tea party meets a boogie down dance party…, when we might have normally thrown Pie Party. We pulled the plug on the tea party because too many forces made it risky (I WILL MAKE THIS HAPPEN!!!). We didn’t really plan to host another Pie Party, but our blogger friends kept asking when it was going to happen. Are you doing another Pie Party? When is the next Pie Party? When? When? When?!!! Finally, the demand won us over and the crowd got the best Pie Party Potluck LIVE! 2014 we’ve hosted to date. Most of the guests were food bloggers from my Tri-State Food Blogger Mailing List and local culinary professionals, but folks traveled from Pennsylvania, too, and we had attendees that came from as far afield as the West Coast. They brought their finest sweet and savory pies to feast on while enjoying each other’s company. 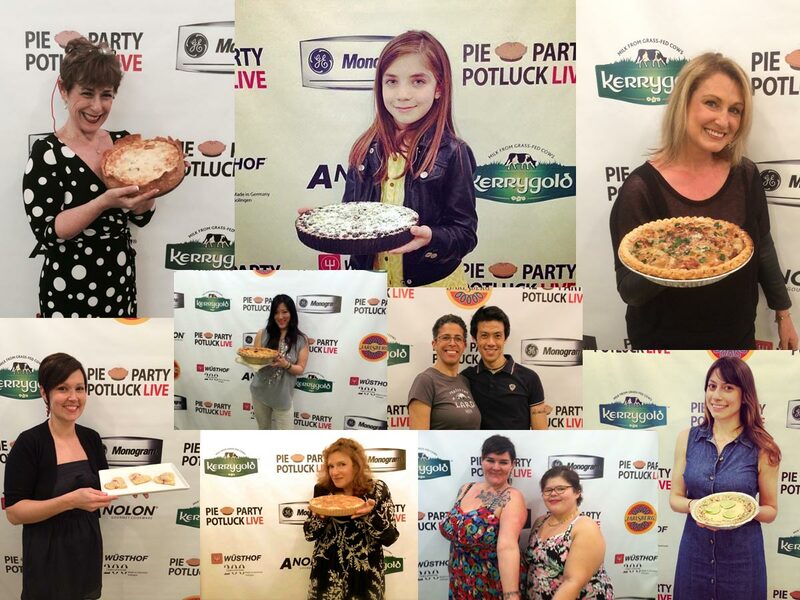 This year it was like the Pie Oscars because we had a step and repeat banner; guests posed on the “bread” carpet with their creation before adding it to the spread of over 75 divine pies. Check out the list of the pies in attendance on my partner Ken’s post, Hungry Rabbit, “NYC Parade of Pies”. I always go gluten-free for Pie Party Potluck LIVE! because I want to make sure the gluten-free guests have enough pies to eat. 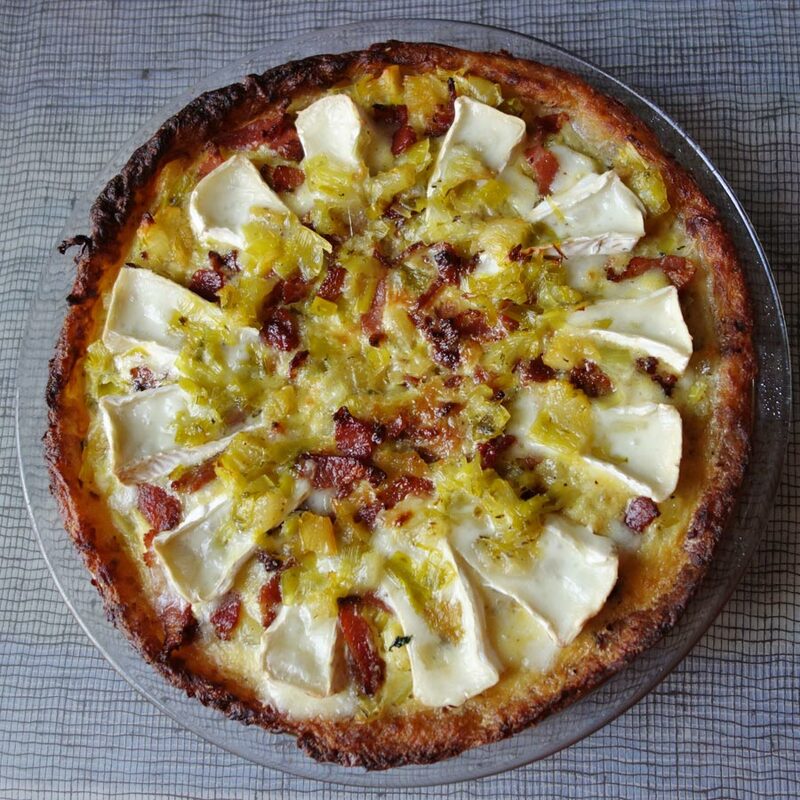 I made a Bacon, Goat Brie, Leek & Pear Pie in a Roesti Crust and a Brûléed Lemon Curd, Chocolate Tart in a Coconut Rice Crust. The latter was delicious but didn’t work out. I made the crust much in the way that you would make a cookie crust. I combined crisp rice crumbs, coconut and butter, pressed it into a pie pan and baked it. It looked quite gorgy. That was topped with a dark chocolate ganache, then a layer of lemon curd. Sounds great, but physics prevailed. When I brûléed the lemon curd, the heat melted the chocolate and the crust below it. When I started to pull the tart ring off, the crust showed signs of a landslide, so I carefully adjusted the ring and served the tart with it on. Taste-wise, the reviews were great, but I’ll be working on that recipe. Pie Party does not happen without two entities. The most important is our community of bloggers and food professionals who attend. Our community rocked another Pie Party out of the park. We especially appreciate the folks who post about the event event on Twitter, Facebook, Instagram, Pinterest and Google+ and who take the time to write about the event on their own blogs because that helps us attract the other essential entity—our sponsors. Paula Cecere and her wonderful team run by Chef Tageré Southwell thanks for the hospitality and deliciousness! You can’t make pie without butter and you make the best pies with this outstanding butter. We loved the cheeses too! Cutting our pies got very classy with their stunning pies servers and knives. Chef Tagere got to play with a wonderful line of pots and pans to make the hors d’oeuvres and do her demonstration for the group. Everyone loves their products and had great fun playing with the OXO tattoos! Have you seen the new strawberry huller? How do you make pies even better? Make them into mini-pies! Literally giving the gift of Pie with their book, “Pie” by Kevin Haedrich to some lucky winners at the party. Dazzling our tastes bud with their goat brie and goat mozzarella as well as their chevres. To add to the fun we ran a bunch of photo contests, during the event, where the bloggers took pictures with our sponsors’ products to try to win cheese, butter, cookware, cookbooks and more! Eryn: Ugly Food Tastes Better - Pie Party Potluck Live! Justine: Little Miss Local - PIE PARTY 2014. The pies brought all the boys to the yard. Thanks to our wonderful volunteers, Bernice, Sara, Thông and Craig, for helping to make this event a HUGE SUCCESS!!!! SPECIAL thanks to my partner-in-making-awesome-parties, Ken Leung.